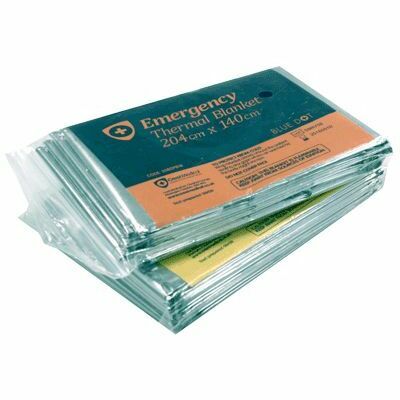 A resourceful tool for any work environment to have in their First Aid boxes, our Emergency Thermal Blanket helps to reduce the rapid loss of bodily heat that is common after trauma or in exposed environments. Simply wrap around the injured person for a wind and waterproof cover that is light enough for use by children and suitable for use both indoors and outdoors. Each blanket comes individually wrapped for easy and compact storage and is so lightweight, it can easily be carried in a backpack during outings. For the most creative teacher, these metallic thermal blankets can also be for outer space adventures or unique picnic blankets. How does an emergency thermal blanket work? The blanket's soft materials forms a tright seal around the body, preventing heat escaping while stopping the evaporation of sweat from the skin. The blanket's reflective surface directs heat in towards the body using thermal radiation. When used appropriately, these blanket's can also be used to reflect sunlightt away from the body, if cooling is required. Here at Gompels, we have a wide range of First Aid & Medical Supplies products to keep your First Aid Boxes stocked up. With everything from Elastic Adhesive Bandages through to Reusable Hot/Cold Packs, you'll find everything you need at exceptional wholesale prices.